Greenlandic authorities made extensive use of a post-office-based savings system to help the citizens get through the lean winter months when fishing and hunting were not as productive. Wowern states  that this system was introduced in 1927 in Northern Greenland; I have not seen any information indicating if the system was expanded beyond Northern Greenland. From the beginning until 1938, when Pakke-Porto stamps were discontinued, the Pakke-Porto (parcel post) stamps were used as the postal savings stamps. They were supposed to be canceled with a numbered "Avane" canceler, however, various other postal cancellations were used as well. I offer the Avane Savings Cancellations here. 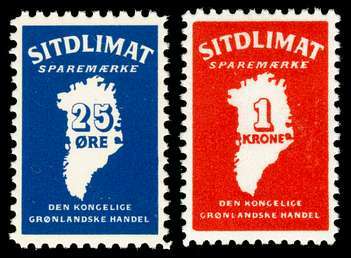 After the Pakke-Porto stamps were discontinued, in 1939 [Daka 1999] purpose-specific postal savings stamps "sitdlimat" (in Greenlandic) or "sparemærke" (in Danish) were issued. They have denominations of 25 øre (blue) and 1 krone (Orange), with the denomination as the central feature of the design. Since the next design was not issued until 1962, there was the opportunity for multiple printings of the first postal savings stamps. 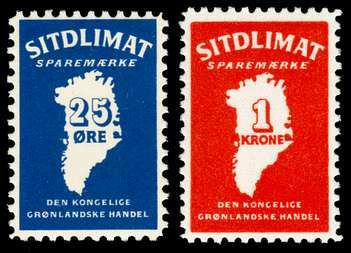 Very little has been formally recorded about the differences between printings, but I have documented significant color differences in the 25 øre stamps. 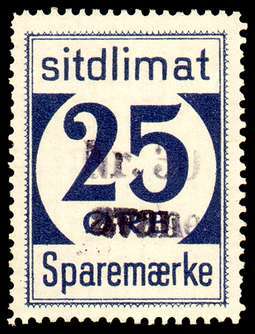 In Used condition, the 25 øre stamps are scarce and the 1 krone stamps are extremely scarce. In Unused/Mint condition, the 25 øre are very scarce and the 1 krone are rare. Used blocks exist, but are quite scarce. In 1962, a new design with a central map of Greenland was issued, with the same denominations and roughly the same colors. They were printed in sheets of 50 (which are extremely scarce, but do exist). Though different printings or perforations have not previously been documented in the literature, these two stamps obviously exist printed at different times. 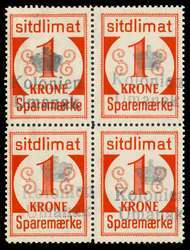 The 25 øre is on yellowish paper with line perforation 10.75 while the 1 krone is on very white paper with line perforation 11.75. In Mint, the 1 krone may be somewhat scarcer than the 25 øre. However, used examples of either are rare. Daka states that the system was discontinued in 1967. From 1957 to 1976 a school-based savings system was also in use and issued a set of 10 pictorial School Savings Stamps which are very scarce. 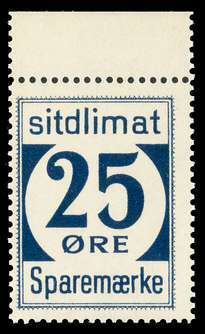 1939 Large-Numeral Postal Savings Stamp: 25 øre Dark Blue. NH with XF-Superb centering. Such nice centering of this issue is rare, especially NH -- this is certainly one of the nicest looking examples I have had in 42 years. 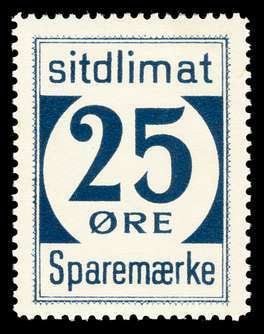 1939 Large-Numeral Postal Savings Stamp: 25 øre Dark Blue. NEVER HINGED F-VF, top margin example. NH examples are extremely scarce and are seldom offered. Wonderfully fresh. 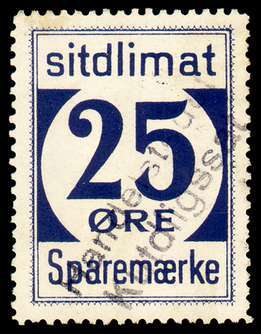 1939 Large-Numeral Postal Savings Stamp: 25 øre Dark Blue NEVER HINGED lower left corner margin 4-block. NH examples are extremely scarce and are seldom offered; blocks are much scarcer. Centering F-VF/Fine with typical variance. The narrow bottom margin is exactly the same as all other bottom margin examples I have ever seen. 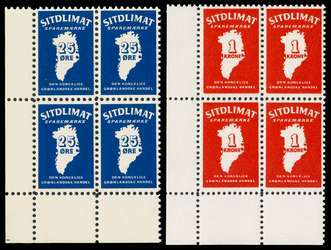 Interesting variety (does not add to price) showing a diagonal blue plate scratch that on the upper right stamp extends from betweet "it" of "sitdlimat" down through the "Ø" of "ØRE" and then into the lower stamp between the "dl" and down through the "R" of "ØRE". Such fresh quality is rare. 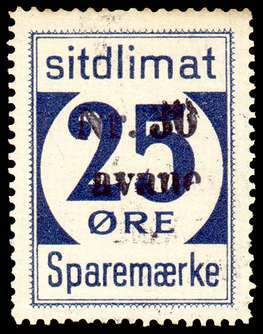 1939 Large-Numeral Postal Savings Stamp: 25 øre Dark Blue with "Nr. 35 OR 36??] / Avane" postal savings cancellation. Used examples probably only came to market after around 1995 and are still seldom seen. Prior to my examination of examples, it was not recorded in the literature that at least two colors of the 25 øre exist (also Ultramarine). Used Superb with excellent perforations and perfect centering; such quality is very scarce. 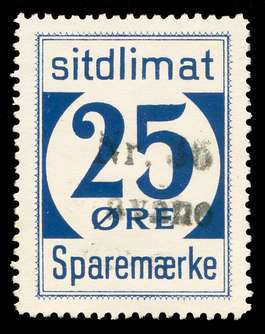 1939 Large-Numeral Postal Savings Stamp: 25 øre Dark Blue with "Nr. 30 / Avane" postal savings cancellation. Used examples only recently discovered; prior to my examination of them, it was not known that at least two colors of the 25 øre exist (also Ultramarine). Used VF with excellent perforations and centering; such quality is very scarce. 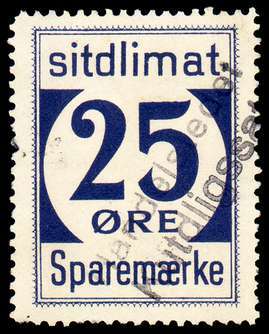 1939 Large-Numeral Postal Savings Stamp: 25 øre Clear Dark Ultramarine with 2-line "Handelstedet Kutdligssat" village cancellation. Used examples only recently discovered; prior to my examination of them, it was not known that at least two colors of the 25 øre exist (also Dark Blue). Used VF with excellent perforations for this issue. These stamps are quite scarce. 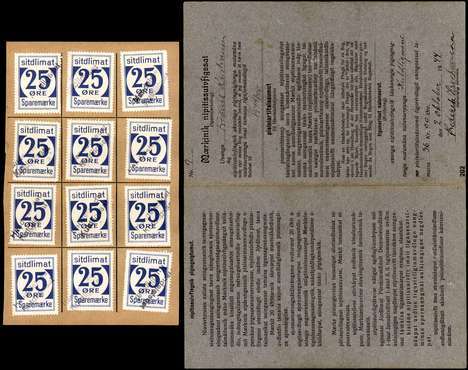 1939 Large-Numeral Postal Savings Stamps on savings book page: 25 øre Clear Dark Ultramarine with 2-line "Handelstedet Kutdligssat" village cancellations. The page has been cut from a savings book. The stamps are not tied by the page by cancellations; the previous owner stated that the stamps in a book had come off a page due to moisture and were consolidated onto this one previously unused page. (However, in actual practice, due to the large size of the stamps, there were often not tied to the page anyway.) A book cover (dated 1944) is also included; this is the first and only example of a post-1938 savings book cover that I have seen in 32 years. 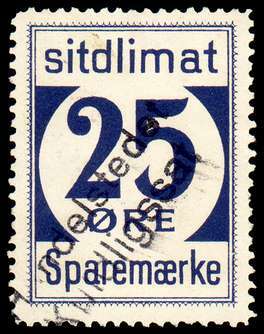 Used examples of these stamps were only recently discovered; prior to my examination of them, it was not known that at least two colors of the 25 øre exist (also Dark Blue). The stamps appear to all be VF centered with typical, or better, perforations. The "break up value" of this page is at least $430, not counting the book cover. 1939 Large-Numeral Postal Savings Stamp: 1 Krone Orange 4-BLOCK with VF Crown and "Kolonien / Umanak" village postal cancellations. Used examples of the 1 Krone value are extremely scarce and blocks are rare; this is the first used block I have had in 37 years and only the second I can recall seeing. Used with VF/F-VF centering with extremely good perforations. Beautiful and rare, but priced as singles! 1939 Large-Numeral Postal Savings Stamp: 1 Krone Orange with VF and complete 2-line, violet "Handelstedet / Kutdligssat" village postal cancellation. Used examples of the 1 Krone value are extremely scarce. Used with VF centering with fairly good perforations for the issue, just a few slightly shorter. A very attractive and scarce stamp. 1962 Small-Size Postal Savings Stamps: Complete set of 25 øre Dark Ultramarine and 1 krone Bright Red NH Superb singles. Though different printings or perforations have not previously been documented in the literature, these two stamps were obviously printed at different times. The 25 øre is on slightly yellowish paper with line perforation 10.75 while the 1 krone is on very white paper with line perforation 11.75. 1962 Small-Size Postal Savings Stamps: Complete set of 25 øre Dark Ultramarine and 1 krone Bright Red NH VF singles. Though different printings or perforations have not previously been documented in the literature, these two stamps were obviously printed at different times. 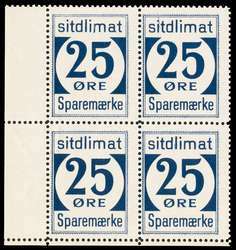 The 25 øre is on slightly yellowish paper with line perforation 10.75 while the 1 krone is on very white paper with line perforation 11.75. 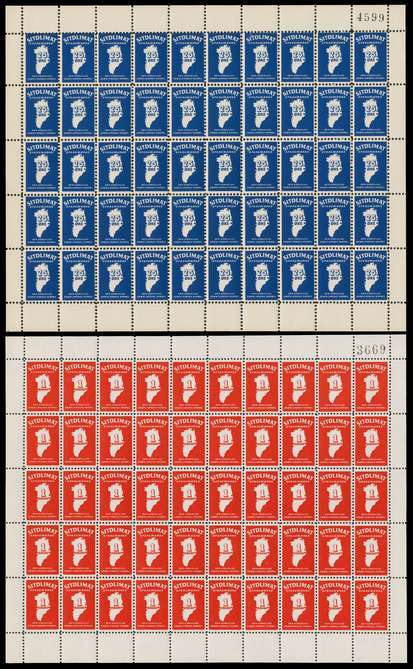 1962 Small-Size Postal Savings Stamps: Complete set of 25 øre Dark Ultramarine and 1 krone Bright Red NH VF/Superb Lower Left Corner Margin 4-Blocks. Though different printings or perforations have not previously been documented in the literature, these two stamps were obviously printed at different times. The 25 øre is on slightly yellowish paper with line perforation 10.75 while the 1 krone is on very white paper with line perforation 11.75. 1962 Small-Size Postal Savings Stamps: Complete set of 25 øre Dark Ultramarine (Fine to VF) and 1 krone Bright Red (VF to Superb) NH FULL SHEETS OF 50. Though different printings or perforations have not previously been documented in the literature, these two stamps were obviously printed at different times. 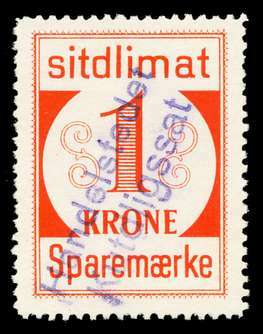 The 25 øre is on slightly yellowish paper with line perforation 10.75 while the 1 krone is on very white paper with line perforation 11.75. Full sheets, especially in such nice quality are very scarce. A set of the two stamps sells for $30-40, which totals $1500 to 2000 for the set of sheets! Offered at a remarkably low price!